Kaleidescape adds Blu-ray capability to its home movie servers | What Hi-Fi? The Modular Disc Vault imports, houses and organises your Blu-ray disc collection, which can then be played back through a Kaleidescape M500 or M300 player anywhere in the home. 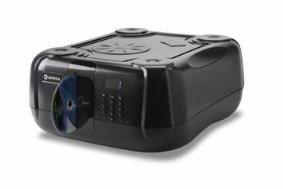 Capable of storing up to 100 discs, the unit delivers "an unparalleled movie-watching experience", its maker claims. Blu-ray films start playing in seconds, not minutes, the Kaleidescape Movie Guide displays high-resolution artwork on your screen with a brief synopsis of each film, and the system can be set up to adjust the lighting, curtains and screen masking in you room automatically. Any number of Modular Disc Vaults can be added to a Kaleidescape system, but each one must be connected to its own M-Class player. The Modular Disc Vault for Blu-ray costs £1195, the M500 player £2995 and the M300 player £1995.